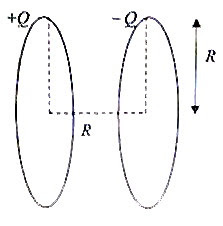 (1) Two identical thin rings of radius R are arranged coaxially with a separation R. A charge +Q is sprayed uniformly on one ring while a charge –Q is sprayed uniformly on the other. (b) What is the electric potential on the common axis, midway between the rings? Justify your answer. (c) A point charge +q is moved very slowly from the centre of the positively charged ring to the cenre of the negatively charged ring. Calculate the work done by the external agency for moving this charge. (d) The charge +q and the negatively charged ring are now moved to a very large distance from the positively charged ring. Now, determine the electric field at the cntre of the positively charged ring. [The distance of the charges on the negatively charged ring from the centre of the positively charged ring is R√2]. (b) The electric potential on the common axis, midway between the rings is zero since the positive and negative charges on the rings produce positive and negative potentials of equal magnitude. (c) The work (W) done in moving the positive charge +q from the centre of one ring to the centre of the other is the product (V1 – V2)q. (d) The electric field at the centre of the isolated positively charged ring is zero since a test charge placed at the centre of the ring will feel equal radial forces all around. (a) It is given that the charge Q1 is positive. Calculate the electric potential difference between the centres of the spheres before bringing them into contact. (b) What are the charges on the two spheres after bringing them into contact? Justify your answer. (c) Calculate the electric field midway between the spheres after bringing the spheres into contact and separating them to the distance r.
(d) Calculate the ratio of the initial charges (Q1/Q2) on the spheres. (e) Keeping the separation at r itself, the charges on the spheres are now changed so that one sphere carries positive charge +4q and the other sphere carries negative charge –q. Calculate the distance of the null point (where the electric field is zero) from the centre of the negatively charged sphere. V1 = k[(Q1/R) –Q2/(r – R)] where k = 1/4πε0. [The sign of Q2 is negative as indicated by the attractive force between the spheres. The distance of the surface of the positively charged sphere from the centre of the negatively charged sphere is r – R and hence it appears in the above expression for potential]. (b) When the spheres are brought into contact, they share the total charge equally since the spheres are identical. Since the total charge is Q1– Q2, the charge on each sphere will be (Q1– Q2)/2. (c) The electric field midway between the spheres is zero since the spheres carry like charges (positive here) of the same magnitude so that a test charge placed at the point will experience equal and opposite forces. F = kQ1Q2/r2 = k[(Q1– Q2)/2]2/r2 where k =1/4πε0. Therefore, Q1Q2 = (Q1– Q2)2/4. Or, 4Q1Q2 = Q12+ Q22 – 2 Q1Q2. The ratio of the magnitudes of the charges (Q1/ Q2) is thus 3 ± √8. Since Q2 is negative, the answer is – (3 ± √8). So, two values are possible for the ratio of charges. Or, 2/(r+d) = 1/d, which gives d = r.